A joint operation of several police units last Sunday led to the seizure of 200,000 packs of cigarettes that entered the country without paying taxes through the Caribbean port of Limón. Officials from the Fiscal Police, the Department of Intelligence and Security and the National Police found the illegal shipment during a routine inspection of containers that arrived Sunday afternoon in a cargo ship that docked in Limón. Fiscal Police estimated the shipment totals four million cigarettes and is valued at $600,000. The cigarettes were past their expiration date of Feb. 12, 2014. Preliminary reports by the Public Security Ministry noted the container departed from Honduras, made a stop in Houston, Texas, and then arrived in Costa Rica. 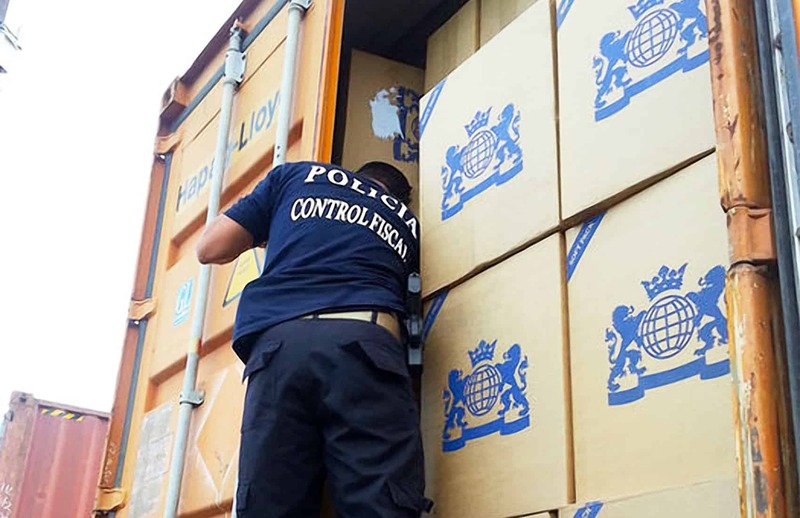 “There were no people detained during the operation and currently we are working to identify everyone linked to this shipment,” Public Security Vice Minister Gustavo Mata Vega said. This is the second largest shipment of contraband smokes discovered this year following a May stop by Fiscal Police of a semitrailer transporting 12 million cigarettes at Paso Canoas, on the border with Panama. Last year, Fiscal Police confiscated more than 21 million illegal cigarettes.